StumbleUpon has rolled out a new look user interface this week, together with a redesigned logo, new colours and new features, including its new “Explore Box” that had only previously been available in its beta program up until now. If you have never heard of StumbleUpon is a discovery engine that allows users to discover and rate Web pages, photos, and videos that are personalised to your tastes and interests. The new revamp will be the first time the service has had a major redesign since its launch back in 2001. Even with its new user interface redesign the mechanics of the site and function of its discovery engine will not be changing, and users will still be able to stumble from site to site. 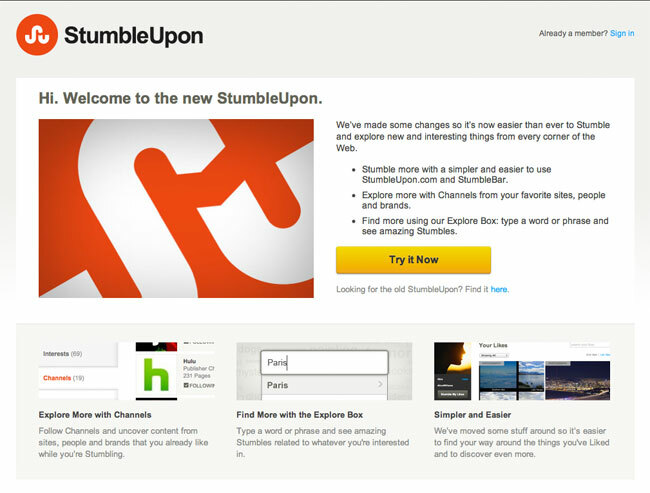 To give the new user interface a go jump over to the new StumbleUpon website.